One week after the death of the King of Rock ‘n’ Roll aka Ronnie James Dio, it’s hard not to use Dio material. But since we had planned something, the Dio-tribute is postponed ’till later. As usual, we selected very solid and worthy material from all over the world: Finland, Germany, Australia, Italy, Venezuela and elsewhere. We’ve got new material from Masterplan, The Ocean, Black Majesty, Eluveitie, Rhapsody Of Fire, Alcest and more. And that includes some requests. On top of that, we’re happy to announce our beloved Polina had an interview with Rhapsody Of Fire co-founder Luca Turilli. Yep, after all those years il Luca finally reserved some time to talk to the Cast about the band, the album and more. So tune in, enjoy the Q&A, and foremost the music and don’t hesitate to leave your feedback at the usual places. Yeah, I cannot watch this. With people who have zits or cysts they are making a choice as to seek professional treatment or not and whether to be filmed for this site or not. Our pets rely on us for their care. For lucky to get to the state so full of worms is animal abuse. I thought the Vet was very restrained in berating the stupid owners. I would have much more to say to them. I love you guys !!!! do not forget to Chile please !!!!!! 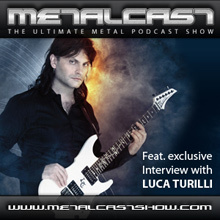 Luca Turilli is my favorite musician! Thank you very much for this great interview! Will Rhapsody come to Argentina? They cancelled the December 2008 tour so we miss them very very much! Success to all of you! Peace and love! !